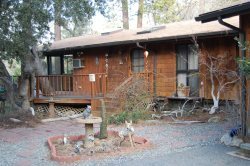 "Welcome to Idyllwild Vacation Rentals! We have specialized in vacation leasing for over 20 years. We provide Personalized Services for our Homeowners and Guests to make your vacation experience one to desire. Just like the World's Finest Hotels every Idyllwild Vacation Rental Home has fresh and professionally laundered sheets and linens. Our housekeeping professionals will have Fresh Linen on each Bed, in each Bath, and in the Kitchen when you arrive. Additional housekeeping and linen services are available upon request, if additional housekeeping is needed let your friendly reservations staff know when you book your accommodations and we can schedule your requests. Snuggle up to a Romantic Wood Fire. If the home of your choice has a wood burning fireplace, we will have everything ready for you to light the fire when the time is right. Additional wood will be available for purchase and delivery from the Concierge Desk. Our Concierge Desk can do your grocery shopping for you. When you arrive the refrigerator and pantry will be stocked with all of your favorites. All that you need to do is provide a shopping list and indicate your preferred payment method for your items and shopping services by email or telephone. Please email us at [email protected] or call us at 800-297-1410. IVR has Bicycles for you to use and enjoy our beautiful mountain sites. We have 4 Multi-Speed Mountain Bicycles. The Bicycles are available on a first come first serve basis. Bicycles can be delivered to your vacation home for a small fee or you can come to the office during business hours and ride away for the day. We can help with your arrangements for arts and craft classes or one on one tutoring from local art professionals. Idyllwild has been voted one of the 100 Best Art Towns in America. Please email or call us at [email protected] or call us at 800-297-1410 to set up classes. We can arrange for your personal hiking or climbing needs, just ask our Concierge Desk. Whether you need a crib for your child or grandchild to sleep comfortably or maybe you need an iron on site, let us know! We will provide anything we can to make your stay as enjoyable as possible. © 2019 | Idyllwild Vacation Rentals - All rights reserved.